What is the purpose of the General Education component? 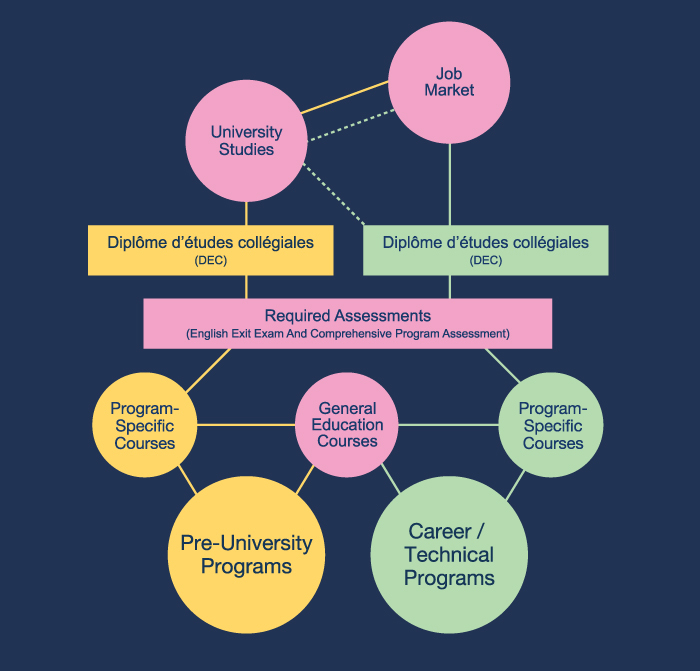 Your English, French, Humanities, Physical Education and Complementary courses are designed to help you develop competencies associated with these goals. The objective of Literary Genres courses is to enable students to apply a critical approach to the study of literary genres. Students will learn to recognize literary genres and their conventions. Successful students will understand a work’s relationship to literary and historical context. The objective of the Literary Themes courses is to enable students to apply a critical approach to the study of literary themes. Students will learn to recognize a work’s literary themes, cultural context and value system. Students will analyze a text from a thematic perspective. The objective of the Block B courses is to enable students to communicate in forms appropriate to specific programs. Students will learn to recognize how facts and arguments are organized in different disciplines. Students will learn to develop their own ideas into arguments, to organize them and to edit their work. The second French course is tied to the student’s field of study. Students who completed high-school outside Quebec will be evaluated and placed on an individual basis. The Humanities courses are developed around three major themes – Knowledge, Worldviews and Ethics. Students must take one course from each of these categories. Courses in this group examine ways of knowing, ways of assessing knowledge and truth and the difference between knowledge and belief. Students will begin to understand how knowledge can be organized, analyzed and related to historical context. Students will consider how knowledge is used to restrict or contribute to the progress of a society. A worldview touches every aspect of a person’s life. A worldview may be common to an entire civilization or historical period, or specific to a particular social group or philosophical outlook. Courses in this group examine how ideas, values and experiences inherent in a worldview influence an individual’s understanding of the world. Students will analyze and compare the central ideas of two or more worldviews with the goal of understanding how worldviews both reflect and shape societies. Courses in this group require students to examine the connection between ethical choices and social responsibility. A number of theories and principles of ethical decision-making are introduced. Students are required to consider opposing sides of issues related to their program of study by applying ethical theories. The three Physical Education courses of the General Education component aim at getting students to develop an active and healthy lifestyle. The 101 course involves identifying the role that certain lifestyle behaviours, such as regular physical activity, good nutrition and stress management, play in the pursuit of optimal health and well-being. Students will examine the health and wellness effects derived from participation in regular physical activity and will explore the effects of their current lifestyle habits. The 102 course is skills-oriented. Each student will be expected to analyze the factors that contribute to the acquisition of skills to be a successful participant in their chosen activity. Using a problem-solving approach, the student will conduct a personal analysis of her/his knowledge and abilities, establish personal goals, and plan strategies leading to the improvement of those skills. The 103 course addresses the competency of designing and managing a personal activity program that incorporates healthy lifestyle choices. This course contributes to the development of responsible behaviours leading to the promotion and improvement of health. The learning situation will require the application of fundamental knowledge and experiences acquired in the 101 and 102 Physical Education courses. The student will explore a variety of health-related activities and be responsible for choosing, performing and scheduling activities appropriate to meet personal needs, interests and abilities. To respond to students’ diverse interests, abilities and motivations, Champlain Saint-Lambert offers a wide range of courses – downhill skiing, snowboarding, water front activities, basketball, badminton, total body conditioning, soccer, volleyball, ice-hockey, hiking, tennis, yoga, weight training, canoe camping and etc.